Martin Garrix and David Guetta are two of the hottest DJ’s and producers in the music industry at the moment. They both consistently release music that can be enjoyed by wide audiences outside of the fans of House music. Last year, the two released their collaborative ballad titled “So Far Away.” Which is not the music one would expect from the two producers, but it was still received well, despite it having a very Martin Garrix-type feeling and sounding vaguely similar to a few of his other slower songs. The track is what you’d expect of a House track but that doesn’t detract from the catchy hooks and easy-to-listen-to quality. Coming from three producers, of course it’s produced well. The natural ebb and flow of the track keeps the listener engaged and excited to hear the rest of the track, while also keeping the body moving. This is a track that will work well is bars, clubs, festivals, and while working out. It’d be a great piece to listen to in the morning as well since the music inspires you to move and get the blood pumping. If anyone was wondering what you get when you put three EDM legends together in a studio, this is what you get! Its October, which brings out the Halloween fun. Meaning pumpkin patches, costume shopping, candy and last but not least haunted houses! But it takes a lot to be a GOOD haunted house. For me, it’s based on a few components: Scare tactics, length, and set designs. Over the weekend I went to a haunted house, I won’t say which one because maybe it could be scary to some, but it just wasn’t for me. Trust me, I love haunted houses, but I’m very hard to scare. Anyway, I wanted to critique what I experienced at this one! 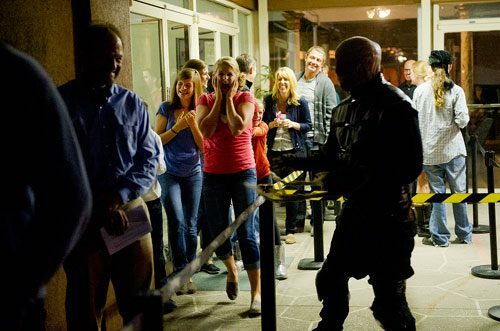 Scare Tactics: How they scare people..
Getting scared is the biggest point of going to a haunted house. They want to get your blood pumping and freak you out with your greatest fears, being it bugs, chainsaws, or a costume of a certain character. The actors in a haunted house tend to make sudden bangs, come out of no where, or get right up towards you just to freak you out. All very useful ideas! Those can be overplayed, or not work well. At the haunted house I experienced, they missed many opportunities to have someone come out to scare you. They did the typical “around the corner” attack, but once you see that one time you’ll be waiting for it again. They did lots of banging on things, it kinda of just made you not think about. Also what’s with actors trying to say something to you? I never hear it because they try to be so “scary” with it that it kinda gets missed, just sounds like blubber. They also didn’t have many people working the haunted house, so there was many rooms that didn’t have people so we just walked through it. Which wasn’t normal, and felt kinda weird cause I didn’t know if we should keep going or wait. Length: How long to get in and how long once inside.. The length matters in how long you wait and how long you are in the haunted house. I say this because you could be waiting a long time at some places. It helps that they have people scaring you in line but sometimes it just feels like they are invading your personal space, at least that is what it was like at this place. Mainly it just seemed weird cause the costumes weren’t that well put together, so it just didn’t have that realistic touch. How long you actually spend in the haunted house can be important. Too short of time and you could just have a bunch of people who just felt like they wasted money. This haunted house felt like a breeze to get through. Worse part is.. it was a two part haunted house! Which basically means it should have been even longer than any regular one, and should have lasted two times longer. 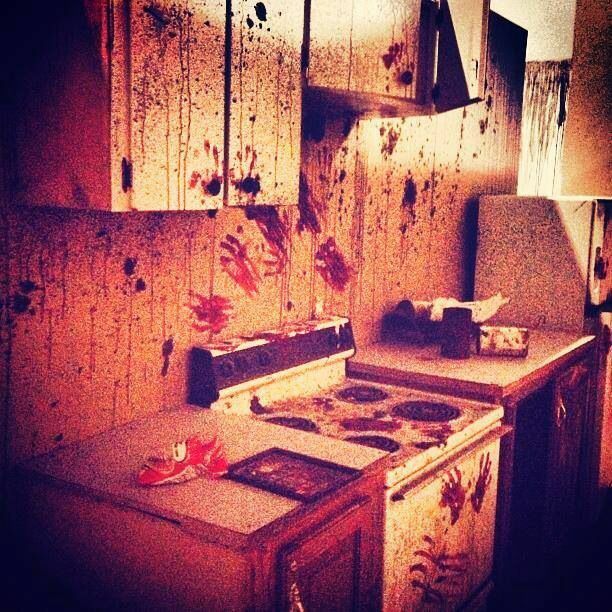 Set Design: What it’s like inside..
Now the set design of a place can really help with the scare tactics. You have those rooms that are decorated like a maze that gets you lost, strobe lit rooms, and ones that they have put very much effort into. The place I went to have very amazing set designs. They had a slaughter house that was very detailed, a hoarder house that was extra realistic, and a theater that showed it’s destruction. Of course they had the maze room and a strobe lit room, but they also had a balloon path that gets you separated from everyone. The best part of this haunted house was the set designs, we actually got to stop and admire them because of how greatly detailed they were. But because of how slow, and limited they were with scarers, it made it less of a haunted house and more like an art project. To compare it, think of a story that you go through but it’s so slow and hard to get into and when you’re about to give up the ending has a few good points. I may be hard to scare, but I always do like a good haunted house. The one I went to just wasn’t one of them. If you know any that are worth checking out please let us know in the comments! Make sure to tun into WCRX Thursdays with Kimmy Spoons and her Alternative Scoop. Only On 88.1 Fm Chicago’s Underground. Kathleen Battle – Opera Superstar in Chicago! On Saturday, September 30th, I had the thrill of seeing a true opera superstar at the Auditorium, here in Chicago. The five-time Grammy Award winner, Kathleen Battle has sung all of the great Operas and reigned supreme at the Metropolitan Opera House, in the 80’s and early 90’s. Reviewers have long rhapsodized about the quality of her voice. One of opera’s premier lyric and coloratura sopranos, the Washington Post said of Battle “…without qualification, one of the very few most beautiful in the world”; from The New York Times “cream from a miraculous, bottomless pitcher”. Her current tour is called Kathleen Battle – Underground Railroad: A Spiritual Journey While not an opera program, per se, Battle’s training and background come through. Presented recital style with only a single piano for accompaniment and backed by a 30 voice chorus including The Chicago Freedom Singers. The show also incorporates the Reverend Dr. Otis Moss III and Jackie Taylor as Narrators who educate the audience about the history of the Underground Railroad. There are quotes from Frederick Douglass and Harriet Tubman, who both used the Underground Railroad to escape to their own freedom and in the case of Tubman, she then helped many other slaves find freedom through the Underground Railroad. Kathleen Battle’s stage presence was amazing and her voice as beautiful and pure as ever it was, considering she is now in her late 60’s, that’s impressive. She also showed great generosity in giving showcasing solos to several of the other singers. The repertoire contained such well known gems as “Swing Low Sweet Chariot”, “All Night, All Day” and “Glory, Glory, Hallelujah (Come Out the Wilderness)”. The presentation was interesting and uplifting, leaving one with the sense of not only having enjoyed an evening of beautiful and unique music, but of also having learned a great deal. I for one, look forward to future concerts presented by Ms. Battle and having the opportunity to enjoy her beautiful voice once again.